Battistelli is doing a lot of what FIFA’s Blatter was doing in order to distract the media and create a positive image of the organisation. The EPO is supposed to be neutral about patents/applications it deals with, but neutrality was thrown out the window under Battistelli's regime (large corporations receive special treatment). There is also this thing called “Inventor Award”, which the EPO keeps promoting in Twitter every week or so (sometimes several times per week), neglecting to say anything about corruptible media organisations that play along. 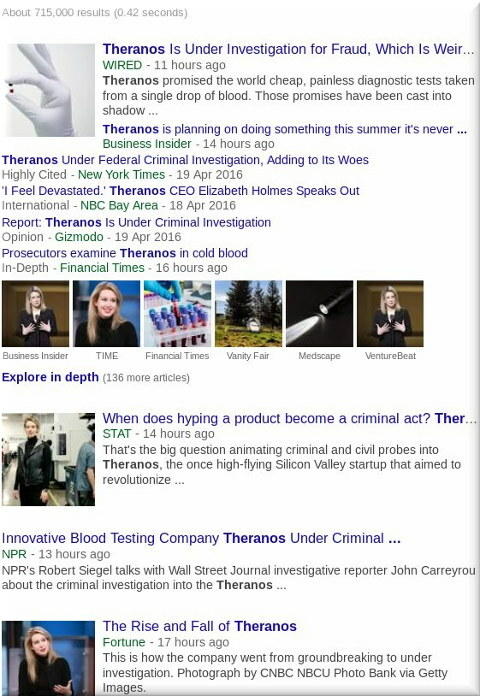 The wheels are coming off the cart at Theranos, the $9 billion startup founded by Stanford dropout Elizabeth Holmes when she was 19. Its proprietary blood testing technology is the subject of a scathing report from the Centers for Medicare and Medicaid Services (CMS), but that’s just the latest in a growing list of woes for the troubled unicorn. First, the FDA declared the company’s nanotube container for collecting blood from a finger prick to be an unapproved medical device. Then, CMS found serious deficiencies that forced a shutdown of Theranos’ Northern California lab. And while the company’s deal with Safeway never got off the ground, Walgreens is reportedly looking for a way to get out of its agreement. But the one thing that the secretive Silicon Valley startup has managed to avoid is peer-reviewed, independent testing that compares the results of its proprietary diagnostic testing to that of other labs like Quest Diagnostics and LabCorp. Last week, that changed, and the results were devastating. What does this have to do with the EPO? 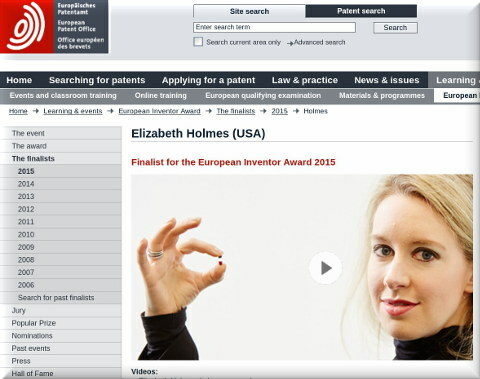 Theranos was somewhat of a VIP at the EPO, owing to the whole “Inventor Award” publicity stunt of Battistelli. What If Lionel Baranes Was EPO President?